Amelie Estrada, architect from Ecosur Nicaragua and Diego Coloma, technician from EcoSur Ecuador, visited the project "Home Improvement" (Caprichando a Morada in Portuguese), implemented by the Rural Housing Cooperative COOPERHAF in Chapecó city, state of Santa Catarina, winner of the World Habitat Award 2009, granted by the Building and Social Housing Foundation. The fifth Vertical Shaft Brick Kiln (VSBK) in Chambo, Ecuador was tested the last November 22 and was a success as planed. The efficiency in the temperature control and speed of burning predicts a promising future for the sustainability of the artisanal clay brick making. Micro-Concrete Roofing tiles: a School for Life. 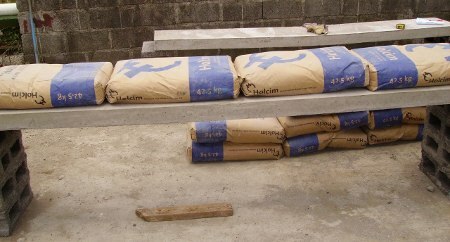 In Cali, the third largest city in Colombia, the School for Life Foundation started the production of MicroConcrete Roofing tiles (MCR) in a project that includes workshops on bamboo and wood building, masonry, gastronomy and marketing & sales. Read more: Micro-Concrete Roofing tiles: a School for Life. School renovations in the north of Nicaragua. Through a partnership between the city of Saarlouis, southwest Germany, and Matiguás, north of Nicaragua, a school located in San Carlos, Pancasán, was remodeled as the first part of a project funded through DESWOS. 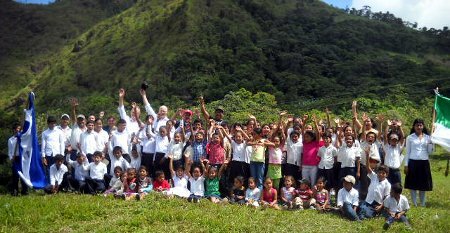 Read more: School renovations in the north of Nicaragua. After the earthquake in Haiti, the village of Liancourt, 100 km north of Port au Prince, has received thousands of people returning from the capital to his hometown. The homes that were occupied only by an elderly couple now have 8 or 10 people because the children with their wives, husbands and grandchildren have returned from the big cities devastated by the earthquake. This sudden increase in population has put great pressure on the public service systems, including education. 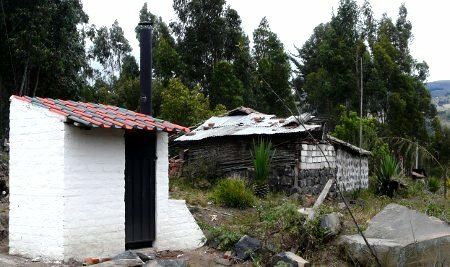 Thanks to the Santa Marianita neighborhood organization in Guano-Ecuador, and the persistence of their leaders, the construction of 15 dry toilets were delivered to the Mayor of the Municipality of Guano and the Prefecture of the province of Chimborazo to improve hygiene, privacy and quality of life in general of its inhabitants. 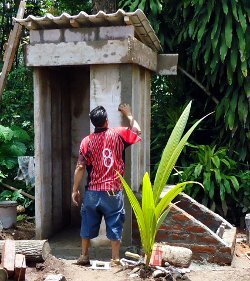 Through a South-Souht technology and information exchange, the first Dry Toilet was built in El Salvador (and the first in all Central America), in a housing project built by the Cooperative Asociation in Savings and Credit Solidary Women, ACAMS, in the town of Tejutepeque. Estuardo Quispillo, head of the Constructions Departament from Red EcoSur Ecuador, flew to El Salvador for a week, from august 16th to 20th, 2010, to give an assesment in Dry Toilets and build the first one in a new settlement, 10 km away from Tejutepeque. Panels of Ferro Cement (PFC) have been used by EcoTec in Nicaragua since 1991, when the Cuban EcoSur partner CECAT intorduced them. The system had been developped by Dr. Hugo Wainsthok who in earlier years had built large fisherboats in ferrocement and in 1984 built a series of two-storey houses with panels in Cuba. 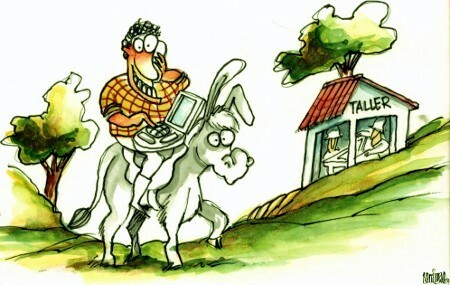 Sharing implies having something to share and not being afraid to share it, a give and take. Often the word “sharing” is substituted by “management”, becoming knowledge management and which implies a power relationship. This relationship is usually just another step on the continuum of north-south power. Sandra Gavilanez, from SwissContact Ecuador, Gina Galvez, from SwissContact Peru, co-director of the Clean Air Regional Program and Eduardo Idrovo, Environmental Quality Techinician from the Environmental Commision of the Municipality of Cuenca, Azuay Province, were very impressed by the energy saving possibilities of the brick kilns built by the EcoSur Network in Chambo through the project "Sustainable Ecological and Economical Production of Bricks"
In Peru, the Clean Air Regional Program (PRAL) seeks that the organizations in charge of the air quality management, in Arequipa and Cusco, implement, through sustainable and replicable models, the objectives of the "To Clean the Air" program in the Peruvian national, regional and local environmental management framework.